One of my favorite places to find recipes is Joanne Choi’s Week of Menus website. 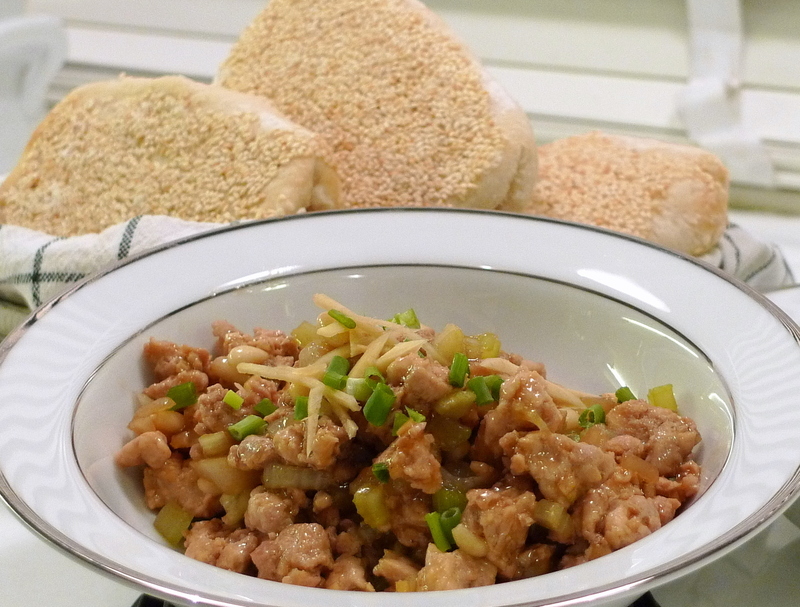 That’s where I found a nice recipe for Minced Chicken with Pinenuts served with Shao Bing, something like a Chinese sesame pita bread. The chicken is prepared in a Shanghainese style with ginger, oyster sauce, and water chestnuts. The Shao Bing, something that you can buy ready-to-bake in the US, was an unfamiliar bread I would have to make from scratch since I am here in Thailand. The Shao Bing was a bit of a mystery. Examples of it on the internet varied both in size, shape, and even technique. I pulled three different recipes from presumably reputable sources, compared them, and decided to try the one from Ming Tsai on the Food Network. After all, he’s Ming Tsai, so how could I go wrong? 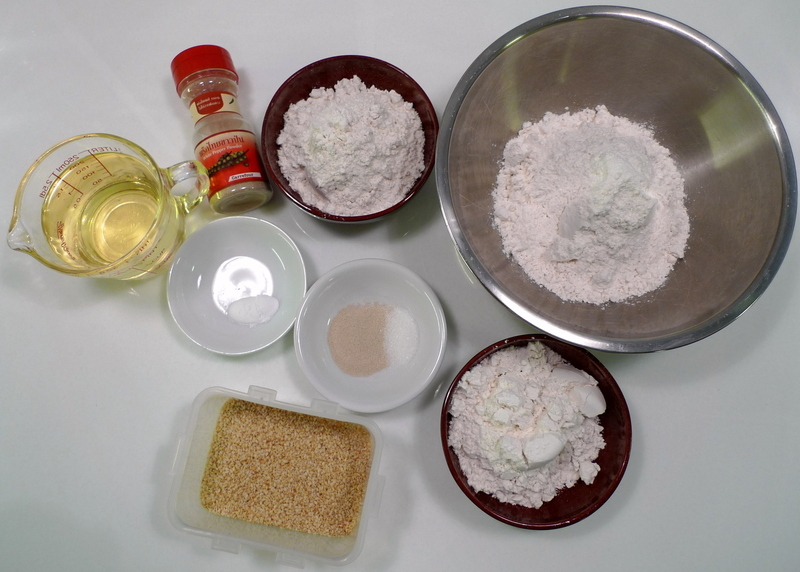 The ingredients are pretty basic: vegetable oil, flour, yeast, baking powder, water, sugar, sesame seeds, and salt and white pepper. You basically make three components to the dough: the first is a roux, a mixture of equal parts oil and flour, heated until the mixture thickens a bit. The second is a sponge, a relatively wet mixture of flour, yeast, sugar, baking powder, and warm water, which is allowed to sit and begin to rise. The third is a dry dough, a combination of just water and flour. After letting the sponge rise and the dough rest, you combine them and knead until completely integrated. After another rest, you roll the dough out to about 1/16-1/8th of an inch. 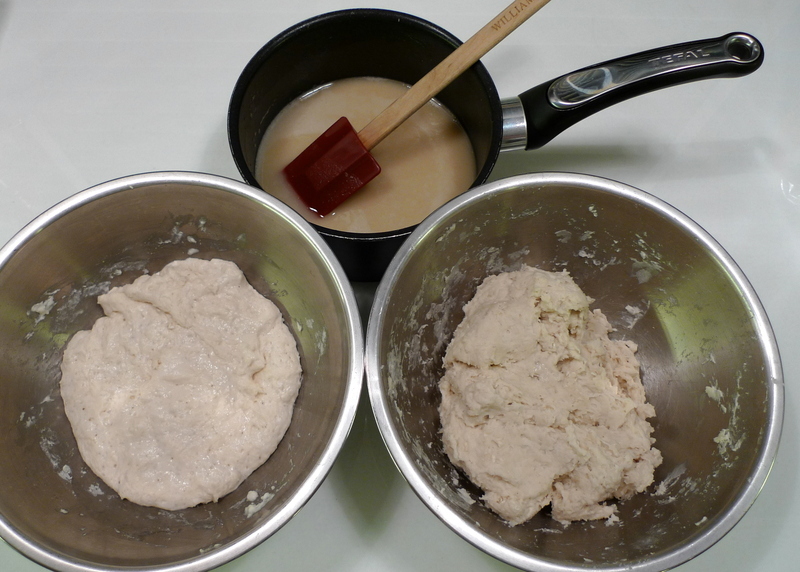 The oil-flour roux is spread on the surface of the dough. Despite following the recipe carefully, I found the roux was too runny – I’m not sure why this happened but it proved to be problematic. Place 1 of the rolls seam-side up and seal the end using a small rolling pin (this will prevent the oil paste from escaping). Fold the roll into thirds, so that the seam is covered. Then roll this tripled roll into a flat dough about 5-inches by 2-inches. Fold this piece into thirds. The stack should be about 2 by 3/4 inches thick. Flip the piece over so that the seam and fold are on the bottom. Cover and set aside. Repeat the process for the remaining rolls. I did the best I could, but wound up with roux everywhere and too much flour on the dough. 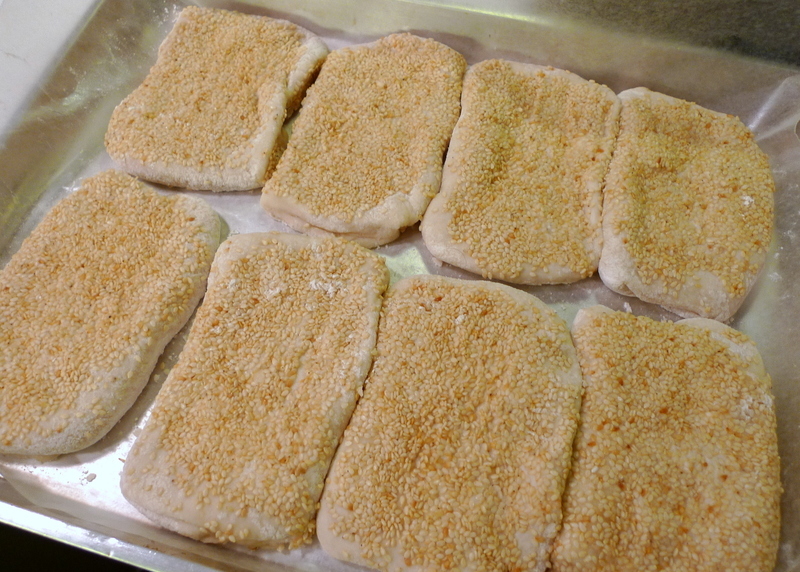 I sprayed one side of the dough with water and pressed it into the sesame seeds. These were baked in a 350 F oven for about ten minutes on the bottom side, then flipped over for another five minutes. 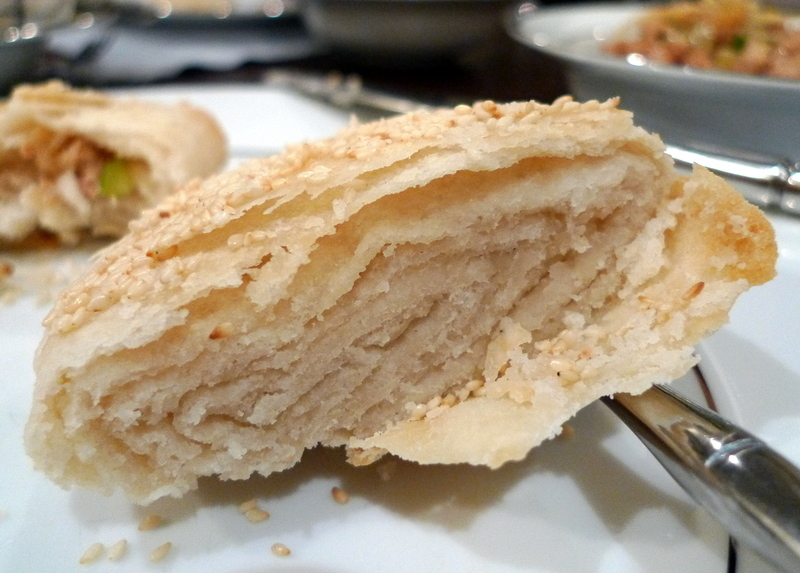 The interior of the resulting Shao Bing looked like this, with distinct layers. The flavor was too floury and it was difficult to really open them like pita pockets. Maybe too many layers? After this meal, I tried cooking a leftover bread in a toaster and spreading it with peanut butter. Worked out much better then! The second half of the dish was the filling you are meant to stuff into the pockets. The original recipe calls for chicken but I used a mixture of chicken and pork for more flavor. Instead of coarsely chopping whole pieces of meat, I used ground meat. It was marinated in a mixture of garlic, ginger, sake (substituted for Shao Xing wine), and soy sauce. 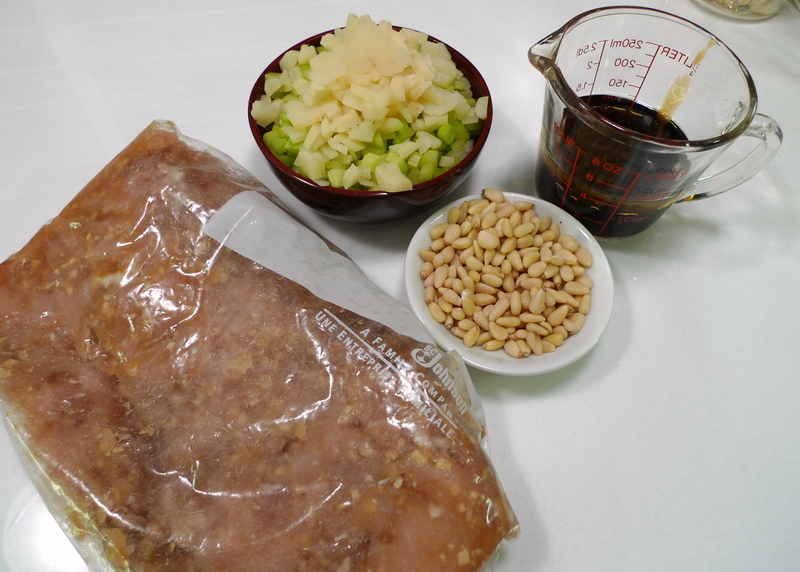 The other ingredients are a mixture of chopped celery and water chestnuts, pine nuts, and a sauce composed of more Shao Xing wine (or sake), oyster sauce, soy sauce, and sesame oil. 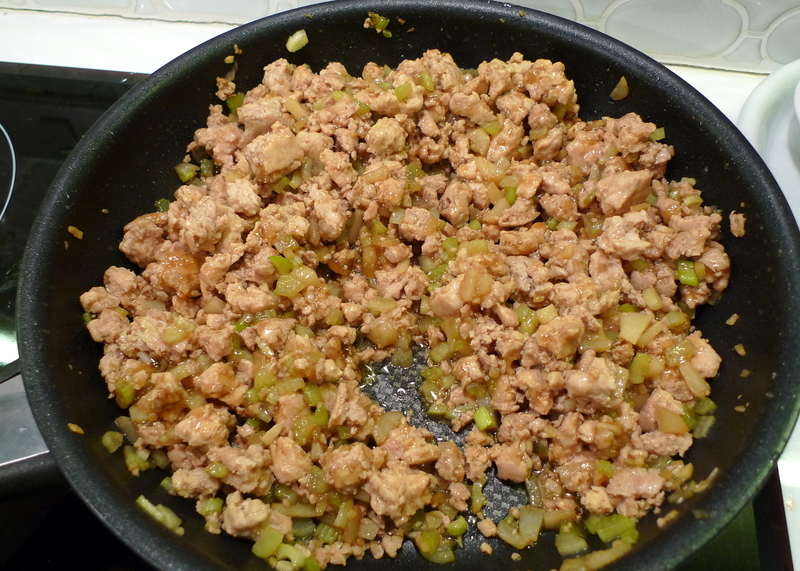 The meat is fried, then the celery and water chestnuts are added, then the sauce is added. Add the pine nuts when the mixture is finished. That’s all it takes. For the final result, serve the Shao Bing with the minced meat mixture, stuffing it into the bread like you would with a pita. The dish was tasty, although the Shao Bing was a bit floury. In absence of the bread, you could actually use lettuce cups, which would be very nice, indeed. I’ll need to try a different recipe for Shao Bing and see what the results are. The other two recipes I have for Shao Bing have different ratios of oil to flour for the roux. This recipe I used was 1:1 and the result was too thin. Another recipe is 3:2, which would be thinner. The final recipe, the one I think I will try next time, is 1:4. Amazing how different they are, no? This entry was posted in Uncategorized and tagged baking, Chinese, cooking, food, Garlic, ginger, Minced Chicken, Pita, Shanghainese, Shao Bing by christao408. Bookmark the permalink. Still looks good. I would most likely have used them as a bread to dip into and take the meat to my mouth. The only way to learn is to experiment. i think the shaobing needs to be rolled out more so the layers get compressed together. the layering is probably to develop some flaky texture, and i guess the idea is to develop this texture but still end up with a somewhat thick bread that isn’t too flat so you can still open it up in the middle. reminds me a bit of the instructions i was trying to follow when making chinese scallion pancakes… after rolling up and cutting the rolled-out and oiled dough, i had to take each piece and twist it three times and then fold it up in some way that i still don’t quite understand, and then roll it out again. needless to say, it was a fun adventure.at least the filling came out well! actually, i went to look up the recipe; between the rolling and the cutting, you are supposed to stretch out the dough a bit. did you try that? that may help bring the layers together. it also means you have less dough to work with at once, so when you roll out the dough after the first fold-into-thirds, it should get a bit flatter and you should be able to compress some of those layers together. Looks good. Hey, can you try to find the coconut milk and gummy worms for me? @amygwen – Gummy worms… ha ha. Yes, I’ll figure out a time to talk about Thai desserts soon. @lcfu – Well, you have to visit Thailand again, Fu. @kunhuo42 – Thanks for looking those details up, Aaron. 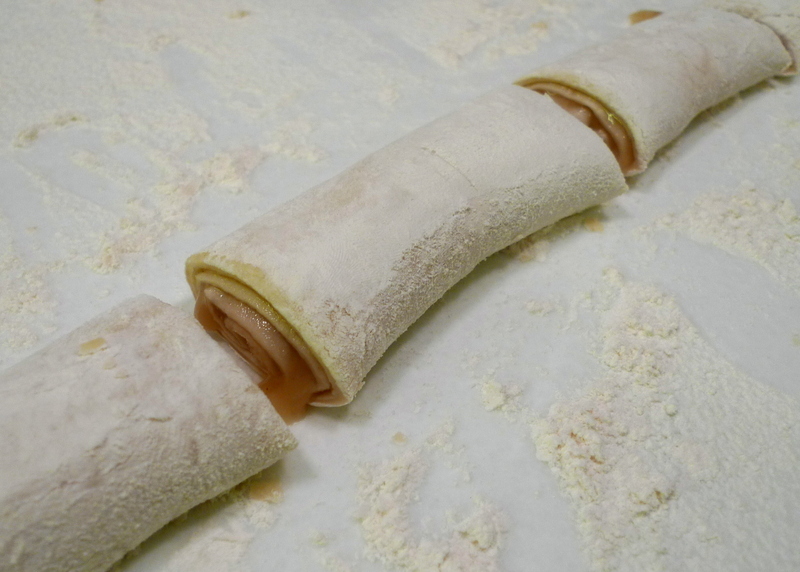 It definitely should be rolled more tightly, stretched out more, and then rolled thinner with a rolling pin. 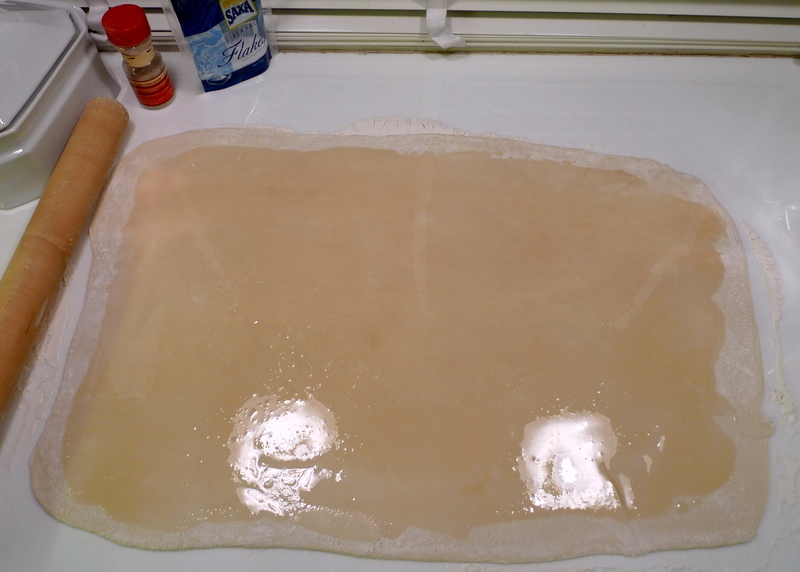 The reason I didn’t do that comes back to the oil-flour roux, which was so runny. I think if it were more like a paste, it would have been easier to handle. I’m going to try one of the other recipes in the future and see if that doesn’t make it a little easier. @Fatcat723 – That’s pretty much the way I ended up eating them, although they were a little thick for using as a cracker. Aaron provided a lot of helpful suggestions, so I will give it another attempt with a different recipe one of these weeks soon. The filling looks delicious at least… Knowing that you are a perfectionist and very tenacious I’m guessing this will be on the menu again soon! yum! yum! thanks for sharing this. i’ll ask my sister to make this one. and i be the food tester. hehehe. I don’t know how to make Shao Bing. It need more skills and practice, I think. Yours look really good. Probably, you need add more oil (or butter) to get more layers. @christao408 – hahaha….I’m not a Shao Bing expert at all. I used to have Shao Bing quite often in China. The bakeries are everywhere in China. They’re very fresh, crispy and cheap. For my generation, I don’t think anyone knows how to make Shao Bing. I am speechless…. so darn impressed. I am Taiwanese and I can’t think of anyone back in Taiwan who would make this at home (always buy them in stores – quicker and easier)…. PROPS!!! (drooooling). @Sinful_Sundae – If only I could find them in stores here! =D@Wangium – @yang1815 – Thanks@foggysunnymorning – Perhaps I need to travel to China and try these Shao Bing first-hand. Then, I’ll know what I’m doing wrong! @christao408 – no Chinese bakeries in thailand? Despite the unfortuante run with the roux, ( no pun here ) it looks very good and appetizing Chris. I should come and sit at your feet to learn to prepare so many of these wonderful dishes. @christao408 – haha…oh well. Good luck! @christao408 – hehe! Like pine needles after Christmas… still stepping on them and we haven’t had a real tree for 10 years!! This looks great my daughter and I are going to try this tonight. I was watching Master Chef last night and they had a Chinese Challenge last night and as the contestants were making their dishes I thought that I would be totally screwed if I had to do come up with a Chinese dish. So I was looking to do a Chinese dish tonight and this will fit the bill nicely. Can’t wait to try it. @Jeff Hiatt – How did it turn out?